When their unborn baby was found to have a large tumor attached to her body, doctors advised Eleanor (El) and Matt Garrett to either terminate the pregnancy or take their chances. 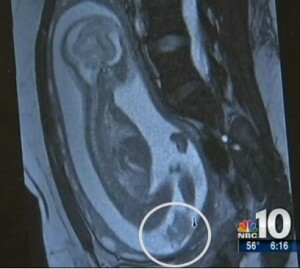 The couple chose to fight against the odds and little Emily was saved by doctors in Philadelphia’s Children Hospital. The tumor that baby Emily had started from her tail bone and continued to her feet according to Dr. Holly Hedrick who operated on her. The mass, a Sacrococcygeal Teratoma, was not cancerous but if unchecked it could continue to enlarge causing fetal heart failure and also putting the mother at risk. The Garrett’s decided to seek help from doctors at the Children’s Hospital instead of terminating the pregnancy. At 34 weeks, Eleanor sensed that something was wrong. She was right. The tumor was hemorrhaging and El immediately had an emergency C-section. 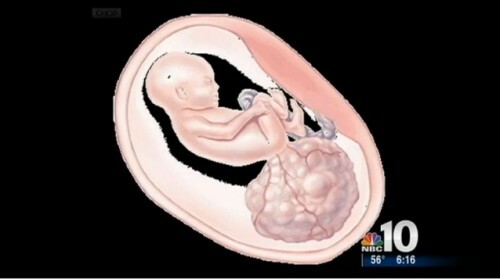 Dr. Hendrick told NBC Philadelphia that it was probably this that saved the baby girl. “One doctor said if we had waited another day she wouldn’t have made it,” said Matt. Now that tumor has been removed, baby Emily has recovered well and after spending 34 days in the hospital is now home. “It’s been a roller coaster but I’m thankful for every day we have with her,” said Matt. Dr. Hendrick points out how critical the surgery was that saved the baby’s life. “If she were born where they weren’t prepared it may not have been a happy ending,” he said. Emily will be monitored by doctors in the days to come but they assure that she will otherwise lead a normal life like any other healthy baby.